The Tariff Act of 1890, commonly called the McKinley Tariff, was an act of the United States Congress, framed by Representative William McKinley, that became law on October 1, 1890. The tariff raised the average duty on imports to almost fifty percent, an act designed to protect domestic industries from foreign competition; protectionism, a tactic supported by Republicans, was fiercely debated by politicians and condemned by Democrats. The McKinley Tariff was replaced with the Wilson–Gorman Tariff Act in 1894, which lowered tariff rates. After 450 amendments, the Tariff Act of 1890 was passed and increased average duties across all imports from 38% to 49.5%. McKinley was known as the "Napoleon of Protection," and rates were raised on some goods and lowered on others, always in an attempt to protect American manufacturing interests. Changes in duties for specific products such as tinplates and wool were the most controversial ones and were emblematic of the spirit of the Tariff of 1890. The Act removed tariffs on sugar, molasses, tea, coffee and hides but authorized the President to reinstate the tariffs if the items were exported from countries that treated U.S. exports in a "reciprocally unequal and unreasonable" fashion. The idea was "to secure reciprocal trade" by allowing the executive branch to use the mere threat of reimposing tariffs as a means to get other countries to lower their tariffs on U.S. exports. Although that delegation of power had the appearance of being an unconstitutional violation of the nondelegation doctrine, it was upheld by the Supreme Court in Field v. Clark in 1892, as it authorizing the executive to act merely as an "agent" of Congress, rather than a lawmaker itself. The President did not use the delegated power to re-impose tariffs on the five types of imported goods, but he used the threat of doing so to pass 10 treaties in which other countries reduced their tariffs on U.S. goods. Tin-plates were a major import for the United States; tens of millions of dollars in these goods entered the country each year. In the preceding 20 years, tariff rates had been raised and dropped multiple times on tin-plates with no change in import levels, and domestic production had remained inconsequential. In a last attempt to stimulate the infant domestic tin-plate industry, the Act raised the duty level from 30% to 70%. It also included a unique provision that stated tin-plates should be admitted free of any duty after 1897 unless domestic production in any year reached one third of the imports in that year. The goal was for the duty to be protective or not to exist at all. The new tariff provisions for wool and woolen goods were exceedingly protectionist. Wool was previously taxed based on a schedule: more valuable wool was taxed at a higher rate. Through a multitude of complicated tariff schedule revisions, the Act made almost all woolen goods subject to the maximum duty rate. Also, the Act increased the tariff on carpet wool, a wool of very low quality not produced in the US. The government wanted to ensure that importers were not declaring higher-quality wool as carpet wool to evade the tariff. The tariff was not well received by Americans who suffered a steep increase in the cost of products. In the 1890 election, Republicans lost their majority in the House with the number of seats they won reduced by nearly half, from 171 to 88. Also, in the 1892 presidential election, Harrison was soundly defeated by Grover Cleveland, and the Senate, House, and Presidency were all under Democratic control. Lawmakers immediately started drafting new tariff legislation, and in 1894, the Wilson-Gorman Tariff passed, which lowered US tariff averages. The tariff was poorly-received also abroad. Protectionists in the British Empire used it to argue for tariff retaliation and imperial trade preference. Tariffs (taxes on foreign goods entering a country) served two purposes for the United States in the late 19th century. One was to raise revenue for the federal government, and the other was to protect domestic manufacturers from foreign competition, known as protectionism. In December 1887, President Grover Cleveland, a Democrat, devoted his entire State of the Union Address to the issue of the tariff and called emphatically for the reduction of duties and the abolition of duties on raw materials. The speech succeeded in making the tariff and the idea of protectionism a true party matter. In the 1888 election, the Republicans were victorious with the election of Benjamin Harrison and majorities in both the Senate and the House. For the sake of holding the party line, the Republicans felt obligated to pass stronger tariff legislation. William McKinley, of Ohio, was defeated by Thomas Brackett Reed to be Speaker of the House after the 1888 elections. 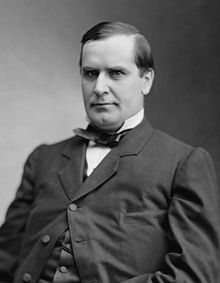 McKinley instead became chairman of the House Ways and Means Committee and was responsible for framing a new tariff bill. He believed that a protectionist tariff had been mandated by the people through the election and that it was necessary for America's wealth and prosperity. In addition to the protectionist debate, politicians were also concerned about the high revenue accruing from tariffs. After the American Civil War, tariffs remained elevated to raise revenue and to cover the high costs of the war. However, in the early 1880s, the federal government was running a large surplus. Both parties agreed that the surplus needed to lessen but disagreed about whether to raise or to lower tariffs to accomplish the same goal. The Democrats' hypothesis stated that tariff revenue could be reduced by reducing the tariff rate. Conversely, the Republicans' belief was that by increasing the tariff, imports would be lessened, and total tariff revenue would drop. The debate would be known as the Great Tariff Debate of 1888. Irwin concluded that the tariff hastened the development of domestic tinplate production by about a decade but also that the benefit to the industry was outweighed by the cost to consumers. ^ Adams, C. K., & Trent, W. P., A History of the United States (Boston: Allyn & Bacon, 1903), p. 512. ^ Reitano, Joanne (1994). The Tariff Question in the Gilded Age: The Great Debate of 1888. University Park, PA: The Pennsylvania State University. p. 129. ISBN 0-271-01035-5. ^ Taussig, F. W. (1892). The Tariff History of the United States (8th ed.). New York, NY: G.P. Putnam's Sons. p. 291. ^ The treaties were with Austria–Hungary (May 20, 1892), Brazil (April 1, 1891), the Dominican Republic (Sept. 1, 1891), El Salvador (Feb. 1, 1892), Germany (Feb. 1, 1892), Guatemala (May 30, 1892), Honduras (May 25, 1892), Nicaragua (March 12, 1892), Spain (for Cuba and Puerto Rico, Sept. 1, 1891), and the United Kingdom (for the British West Indies and British Guiana, Feb. 1, 1892). ^ "Reciprocity Treaties with Other Countries". The New York Times. November 24, 1901. ^ Olcott, C. S., The Life of William McKinley, vol 1 (Boston: Houghton Mifflin, 1916), p. 172. ^ Palen, Marc-William (2010). "Protection, Federation and Union: The Global Impact of the McKinley Tariff upon the British Empire, 1890–94". Journal of Imperial and Commonwealth History. 38 (3): 395–418. doi:10.1080/03086534.2010.503395. ^ Irwin, Douglas A. (1998). "Higher Tariffs, Lower Revenues? Analyzing the Fiscal Aspects of 'The Great Tariff Debate of 1888'". Journal of Economic History. 58 (1): 59–72. doi:10.1017/S0022050700019884. ^ Irwin, Douglas A. (2000). "Did Late-Nineteenth-Century U.S. Tariffs Promote Infant Industries? Evidence from the Tinplate Industry". Journal of Economic History. 60 (2): 335–60. doi:10.1017/S0022050700025122.